Since the advent of micro:bit, its simple and practical way of programming is widely loved by makers, students and teachers. Its sample design, coupled with a wealth of pin resources, give it infinite possibilities. 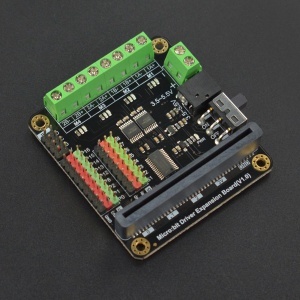 This expansion board not only leads to 9 micro: bit onboard GPIO interfaces, but also comes with 4-way motor drives and 8 servo interfaces, of which 4-way motor drives can be reused as 2-way stepper motor drives. 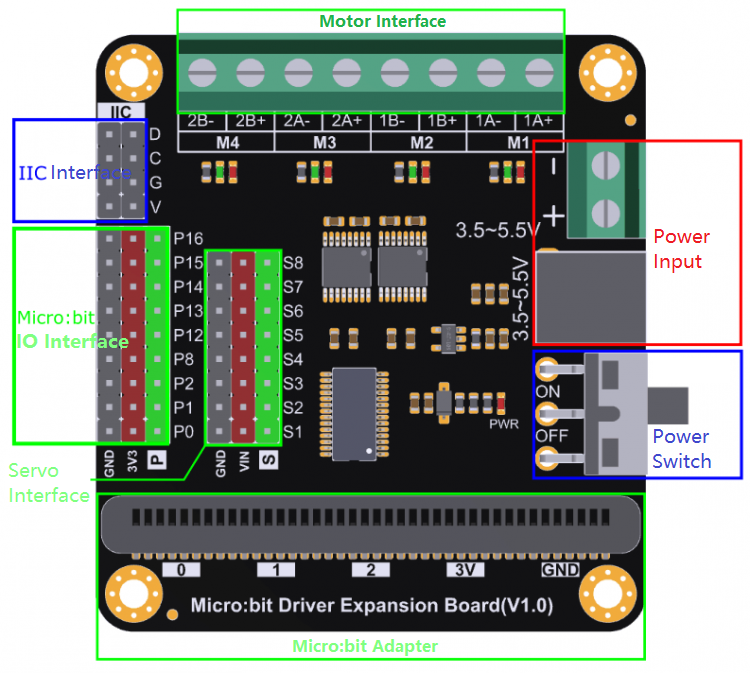 Micro:bit Driver Expansion Board adopts IIC external drive chip to control the motor and servo motor, only takes up two IIC pins and can complete the motor and servo dual control without occupying other resources. Using HR8833 motor driver, the maximum continuous operating current is 1.5A, it can drive the ordinary small motor and N20 mini metal motor. Each motor port comes with a positive and negative rotating indicator to identify the motor running direction conveniently, which is very suitable for students and makers to make small projects. Both the extended GPIO and the servo interface use the DFRobot _ Gravity standard interface, supporting a large number of modules and sensors. The servo interface is directly connected to the Vin power supply, thus increasing the supply current which can support multiple servos to work at the same time. This expansion board supports 3.5V to 5.5V power supply. It provides a DC 2.1 plug and a wiring terminal which can be connected directly to three dry battery boxes. It comes with a USB to DC 2.1 adapter cable, which can be powered by power bank and is more economical and environment-friendly. Result: The motor M1 and M2 rotate in positive direction at a speed of 150 for 2 seconds, then reverse for 2 seconds, in endless loop. 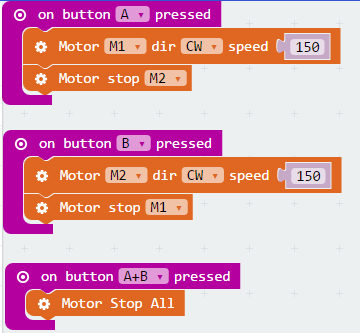 Result: When the button A is pressed, M1 rotates forward and M2 stops; when the button B is pressed, M2 rotates forward and M1 stops; when both button A and button B are pressed at the same time, all motors stop. 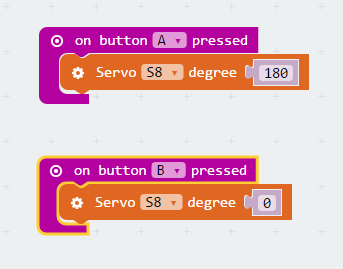 Result: When the A is pressed, set the angle of servo to 180°, when the B is pressed, set the angle of servo to 0°. 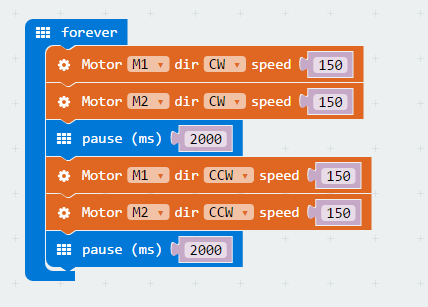 Result: When turned on, the stepper motor rotates clockwise 180°, then rotate counterclockwise 180°, in endless loop. 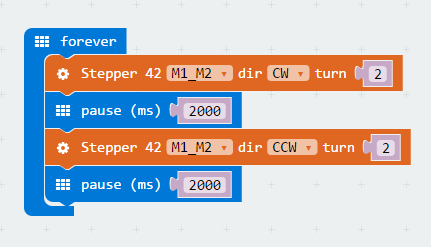 Result: When turned on, the stepper motor rotates clockwise for 2 turns, then rotates counterclockwise for 2 turns, in endless loop. Get Micro:bit Driver Expansion Board from DFRobot Store or DFRobot Distributor.